Samsung Electronics announced today the launch of SeeColors app for QLED TV, which is compatible with all Samsung QLED TVs. The SeeColors app* for QLED TV helps people with Color Vision Deficiency (CVD) identify their personal visual deficiencies through the app. Based on the individual’s results, QLED TVs, featuring 100% color volume, adjust the color settings on the display, allowing viewers with CVD to enjoy a viewing experience with more optimized colors. Nearly 300 million people globally have CVD, with approximately 8% of men and up to 1% of women affected**, based on a representative survey conducted in Europe and North America. However, the majority of people with CVD are unaware of their condition and the impact it has on their quality of life. Through the SeeColors app on the TV, users can identify the type and level of their CVD then directly recalibrate their QLED TV screen based on their personal results. To offer an easy method for people to identify CVD, Samsung Electronics partnered with Professor Klara Wenzel who heads up the Department of Mechatronics, Optics and Mechanical Engineering Informatics at the Budapest University of Technology and Economics, to adopt the Colorlite Test, or C-Test, for TV and mobile devices. C-Test, developed by Professor Wenzel, is a digital test that uses the concept of color filters and mathematical modeling to identify CVD. Adopting the C-Test through the SeeColors app has resulted in a simple solution which gives people with CVD the opportunity to see the world through their QLED TVs in more optimized color. The SeeColors app is available for download from the Smart TV App store. Users can also download the app to conduct the test through Google Play and the Galaxy App Store for Samsung Galaxy smartphones S6, S6 edge, S6 edge+, S7, S7 edge and S8 devices. Once users connect their Galaxy smartphone to their QLED TV, the TV will automatically adjust the color setting based on the user’s results. 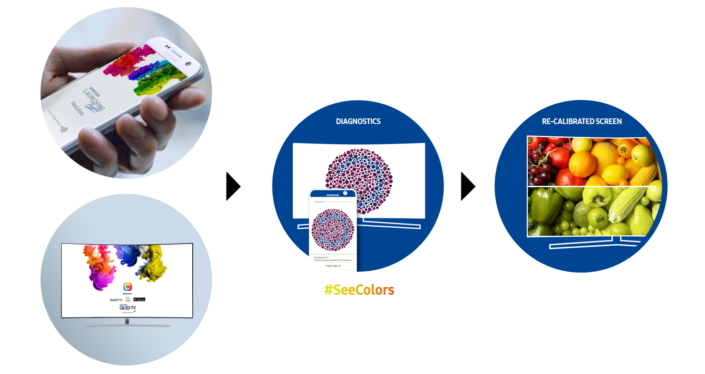 The SeeColors app is created in partnership with Colorlite®, a Hungarian company that applies certified technology based on 20 years of scientific research to lenses to help people address CVD. The SeeColors app marks the first time Colorlite® is being used on TVs and smartphone devices. Samsung Electronics has committed to providing a wide range of accessibility features via its innovative products, and its efforts have been recognized with CES Innovation Awards in 2015, 2016, 2017 and 2018. *This app is not intended for use in the diagnosis of disease or other conditions, or in the cure, mitigation, treatment or prevention of disease or medical problem. Any information found, acquired or accessed through this app is made available for your convenience and should not be treated as medical advice. **Calculation based on Fletcher, R. & Voke, J. (1985) Defective colour vision: fundamentals, diagnosis and management. Adam Hilger, Bristol.